The pianoforte from the home of 1916 leader, Thomas MacDonagh, has been donated to the centre and conservation work on the piece has been organised by the Cloughjordan Heritage Group. It now takes pride of place in the new MacDonagh Heritage Centre.The Cloughjordan Heritage Group is delighted to have been given the piano by the Hennessy family who over the years maintained the instrument. The pianoforte was initially brought to Cloughjordan by MacDonagh’s mother, Mary Louise MacDonagh, née Parker. The instrument made the journey with the family from Cloghan, Co. Offaly to Main Street, Cloughjordan when MacDonaghs parents were appointed teachers at the newly opened Catholic Primary School. In addition to teaching in the new school Mary Louise began to instruct local children in piano playing. The piece is a small square pianoforte of typical simple design of the mid-19th century but, its fine Brazilian Rosewood veneer and covered ivory and ebony keys would have made it a special piece. The pianoforte was constructed about 1850 by the London firm of Collard and Collard, and the maker’s number is still visible. The group hopes to use this number to build a history of the instrument from maker to player. On her last move within the village Mary MacDonagh gifted the pianoforte to the Hennessy family. Mary Louise died in 1908 and the pianoforte has been beautifully and lovingly cared for by the Hennessy family until now. 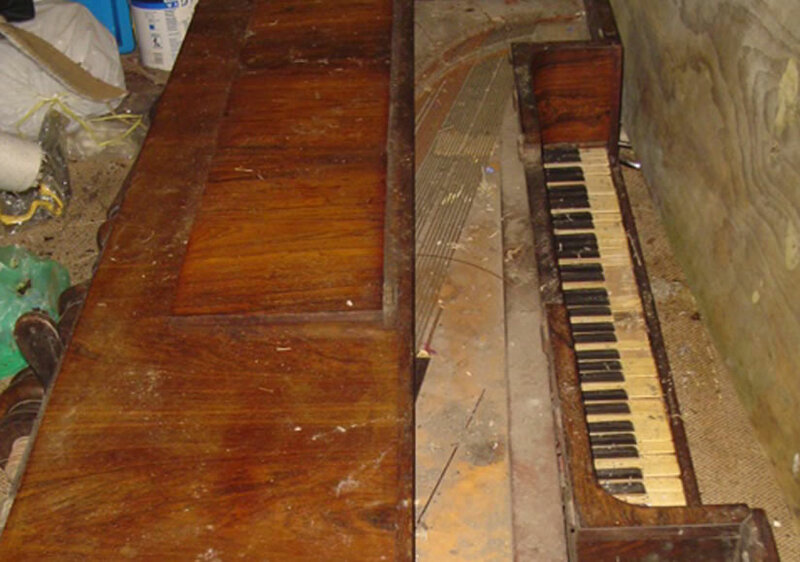 Over the last number of years the pianoforte has suffered a degree of deterioration, and was sorely in need of emergency conservation work. The Cloughjordan Heritage Group appointed Conservation Letterfrack (http://www.conservationletterfrack.ie/) to undertake this work and their fine work is now available for all to see. Now restored to its former beauty it has pride of place in the new Cloughjordan Heritage Centre, its original home where it was played, probably even by Thomas himself, over a hundred years ago. While beautifully restored it still needs further work to bring it to fully playable condition. If you wish to help us in the conservation of this beautiful instrument please use the donate button on our website. All help is appreciated and acknowledged.